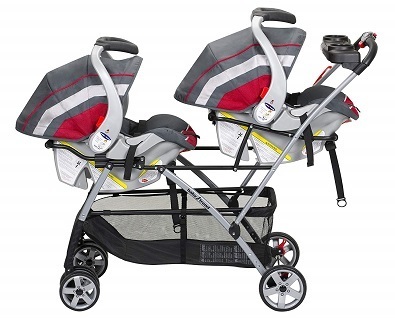 Make your life with the two twins a little easier by investing in the right twin stroller. When it comes to best twin strollers with car seat, the options are plenty. Here, we have zeroed in on only the best ones that are easy to use and designed to make your car journeys a little more comfortable. Bringing up twins is not an easy task. However, you can make your life a lot easier during the initial year by purchasing a stroller that comes with a lightweight frame compatible with car seats. The options are many for all-terrain and full-sized twin strollers. 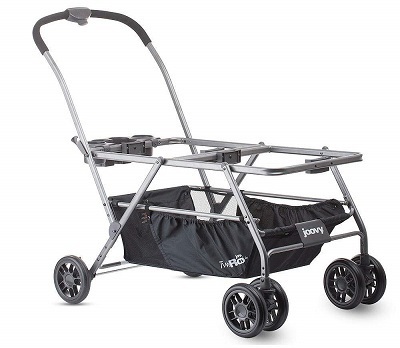 It is a known fact that the all-terrain strollers are the best choice, but they are heavy and can weigh up to 35 lbs. Pushing a 35 lbs strollers with two babies in it can be a little overwhelming for you, more so, when you just had a C-section. Isn’t it? Most new twin moms prefer to keep it simple and opt for lightweight twin strollers with car seats. You can upgrade to a heavier-duty one when your kids have grown a little, you are in better health and shape, and most importantly, you have a better understanding of your kid’s requirements. This double stroller is one of the best options you have if your budget is on the lower side. It is 39 inches long and measures 18.13 lbs only. The frame is easy to hold and is designed with a lot of storage options. You will have a spacious basket and two cup holders to keep your stuff arranged. The size of the stroller is also small and can fit into the trunk of a small car. You can easily place two infant car seats easily onto this frame without having to remove your children. You can strap Graco SnugRide and Chicco car seats onto this frame and take your kids for a stroll outside. The frame is compatible with a wide range of other car seats. Just buy twin baby car seats and strap it to the frame. 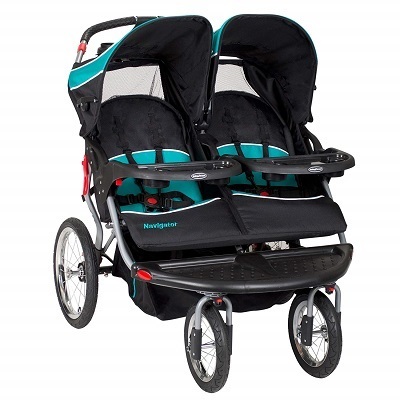 This Baby Trend double stroller is one of the best options you have. Available at a pocket-friendly price, this stroller offers a lot of stability and security to your little ones. It is easy to push and assures a smooth ride for your kiddos, every time. Front-lock swivel wheels glide easily over grass, sand, and even rocks. This stroller is an ideal choice for newborn twins as well and not just grown-up twins. It can accept one or two car seats, and the choice rests completely on you. The padded seats recline fully to ensure comfort to your kids. The 5-point safety harness keeps your kids held in one place. The stroller is easy to fold and comes with a variety of storage option. Blending quality, performance, and durability, this stroller is undoubtedly one of the best options in the market. The fact that it easily glides over all terrains makes it a perfect choice for parents who travel a lot. This double car seats stroller frame is a great choice for parents who do not drive a compact car. It is designed to hold two infant seats side by side, and you can install the car seats to face the same or opposite direction. It comes with a large basket for storing all the baby essentials and four cup holders. It is compatible with a wide range of car seats from the brands like Chicco, Graco, and Maxi-Cosi to name a few. The stroller is easy to use and comes with the one-hand fold mechanism for your convenience. This TwinRoo+ offers good maneuverability and comes with a stable and sturdy finish. The Joovy TwinRoo+ offers a lot of value for money. It is a sturdy double stroller frame that comes with a lot of storage options. The minimalist style of the stroller prevents it from weighing too much, making it a perfect choice for the new mothers. If you do not want to buy a frame stroller but twin strollers with two car seats, this is another option you have. 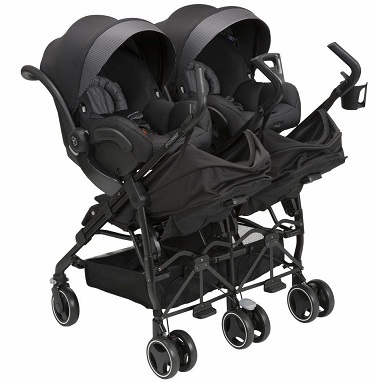 The Maxi Cosi Dana for 2 is specifically designed to make going out with your little twins a breeze. It accepts two car seats at the same which is, of course, a great thing. The stroller has car seat adapters and is compatible with only Maxi Cosi car seats. You can use the stroller in many ways. You can use it with two Maxi Cosi car seats, or use it with a regular stroller seat and one car seat, or with the regular stroller seats. Now let’s take a look at this pros and cons. This is one of the best strollers for mothers with twins. It will make a perfect choice for infants as well as toddlers. The twin car seat stroller combo is an ideal choice for parents who travel a lot. These twin baby car seats are well-known for their sturdiness, quality, durability, and of course comfort to your babies.